Join Lt. Blender's Army of Independent Sales Representatives! Join Lieutenant Blender’s Army of independents having fun at sales/marketing events around the country and in your back yard! Our award winning cocktail mixes give you an exciting opportunity to use your outgoing personality and sales skills to earn while having fun. This can be a great fresh start where you are compensated for your skills and efforts. Click on the video to see us in action explaining our Cocktails in a Bag®. If this looks like fun, then this is the job for you. Make no mistake about it, we're looking for people that have enthusiasm and are ready to learn. 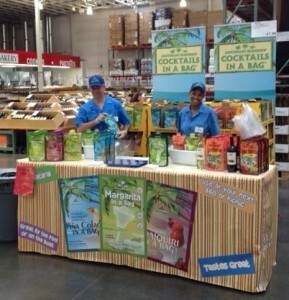 You'll be out there interacting with customers, showing off and selling Cocktails in a Bag®. Q: How much does the position pay? A: Since this is an Sales position you will receive commission for your sales for the day. Our reps make anywhere from $75 to $375 a day depending on their sales abilities. Q: What are the events like? A: The events are held inside other retail stores all over the area. They last 11 days with setup happening the night before the event. We make up product for samples and set up our booth on Wednesday evenings around 8:30pm and start the demos/sampling at 10 am on Thursdays. We work the hours specified by the client but generally 10am to 6pm M- Th, Sun and 10am to 8pm Fri - Sat until the end of the event on Sunday. The events do happen over the weekends and this is when most of the sales happen. During the event the independent sales reps makes up the product and samples it to passing customers while showing off the Cocktails in a Bag®. The more the independent sales rep sells the more they make. The sales rep must constantly get out there and interact with the public! This is not a position for people with shy personalities. Q. Is the position Full time, Part time, how often will I be scheduled? Depending on how much you’d like to work you we have events starting pretty much every Wednesday all year long. We send you a list of the events available for your area and you pick which ones and which dates work with your schedule. Q: What does it mean to be an independent contractor? So what does that mean? It means we are contracting with you to bring your own processes and methods to perform sales events. We can provide you with product information and information on how others have successfully sold our product but in the end how you choose to work the event is up to you. It also means that you can choose which events you would like to work or not. You can work one event a year or work all year. All you need to do is say yes to the events you’d like to work and no to the ones you’d like to pass on. A: All we ask is that you have enthusiasm, a dependable work effect, and reliable transportation to get to and from the events. If you're ready to earn a great wage, learn some new skills and have fun at work just fill out the and submit the form below. One of our area managers will call you shortly for an initial interview.